If the recent iPhone 5C leaks weren’t enough to get you excited, and then there’s the fact Apple’s event is only a few days away on September 10th, then this is sure to get you excited. A video has been leaked which claims to show the new iPad 5 and it’s updated shell. We’ve heard that the iPad 5 will adopt the same design look of the iPad Mini, featuring smaller bezels whilst retaining the same size screen, and whilst there have been a few leaks, nothing major has come up. However, a video uploaded byuploaded by Unbox Therapyshows an empty iPad 5 shell and front panel being compared to the current iPad. 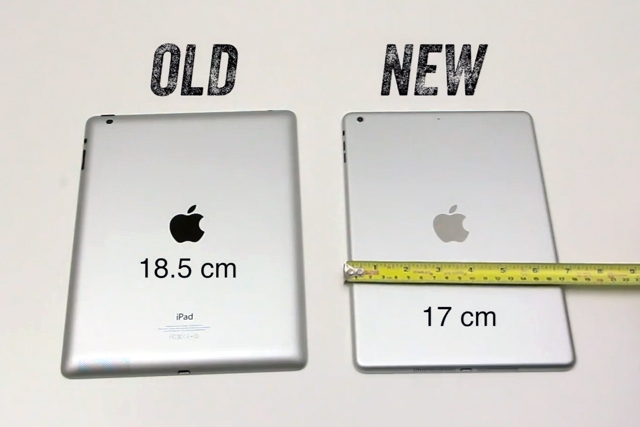 Assuming the parts are real, the new iPad will be significantly narrower — 15mm, or two-thirds of an inch – than the previous model, with slim side bezels similar to the iPad Mini. The iPad 5 shell seems to also be significantly lighter, with the narrator of the video being able to hold it with ease in one hand. It was always thought that the iPad bezels were made thicker by design rather than being forced to due to a technical reason to avoid accidental screen presses when holding the bezel. Although the proof will ultimately not be until the iPad 5 is released, the video seems to show it being held without any real problems. It is expected that Apple will focus on the iPhone 5S and iPhone 5C, as well as releasing iOS 7 at the September 10th, with the iPad 5 and iPad Mini 2 not seeing public eyes until 2014. Consequently, although this seems like a solid leak, as with any leak, it should be taken with a pinch of salt, as Apple can change their mind at any time. However, with that said, it does tie into what we’ve been hearing about the design replicating the iPad Mini.